Tigers InterchangeJake King off due to the blood rule. Tigers InterchangeShane Edwards and is possibly out for the game. Eagles InterchangeMitchell Brown off due to an injury. Tigers InterchangeTy Vickery off due to the blood rule. BEHIND TIGERSWhite lets rip from 50 hard up against the boundary and registers the first score; one behind. A dramatic day involving the Melbourne Football Club but round 10 is not done and it's time now to turn our attention to Perth. West Coast and Richmond battling for a foothold in the top 8! Underway! Welcome to Monday Night Football for the clash between the Eagles and Tigers at Patersons Stadium. Both squads are lining up as selected and our substitutes tonight are Andrew Embley and Sam Lonergan. Welcome to Patersons Stadium for the West Coast Eagles v Richmond Round 10 clash. RICHMOND has announced itself as a genuine top-eight contender with a dominant 41-point win over West Coast in front of 37,781 hostile fans at Patersons Stadium. 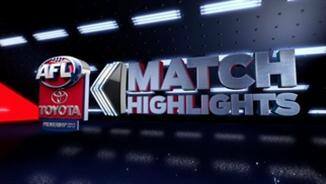 Having snatched defeat from the jaws of victory against Fremantle at the same venue five weeks ago, the Tigers buried that memory with a systematic dismantling of a brittle Eagles side, winning 16.7 (103) to 8.14 (62). "I don't think there’s a better feeling as a footy club to come away and win at a ground that is very, very hard to play at,” Tigers coach Damien Hardwick said. “It’s probably the one time you do enjoy a three-and-a-half, four-hour plane trip on the way home." West Coast were again exposed at home, losing their fourth game at Patersons Stadium in a season that has rapidly gone from promising to problematic. After trailing at quarter-time by six points, the Tigers put together a scintillating second quarter to take the game away from West Coast. Richmond's pace and spread cut the Eagles to ribbons as they kicked six unanswered goals for the term. "Obviously we weren’t sharp enough to shut down their open players and that's what was pretty disappointing for us." Brett Deledio had nine disposals for the quarter and Matt White gathered eight, while talented 19-year-old Nick Vlastuin and evergreen former skipper Chris Newman kicked two goals apiece to silence the crowd. Richmond kicked 10 straight goals between quarter-time and the 11-minute mark of the third term. The Tigers turned a 28-point lead at half-time into a 50-point gap at the last change. Just as pleasingly for coach Damien Hardwick, the visitors had 10 individual goalkickers on a night when their evenness across the board was a key to their success. Dustin Martin and Deledio were outstanding, collecting 25 disposals each, with Deledio particularly damaging as he operated at 84 per cent efficiency. Vlastuin finished the night with three goals, the best return of his six-game career. 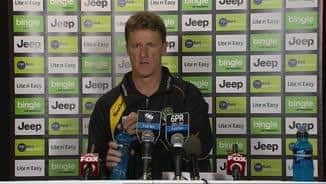 "He's a very good player," Hardwick said. "He only had 16 touches, but everything he does, he does to a very high level. It's hard to believe he's only played six AFL games. "He's got some areas of his game we'd like him to improve, but we think he's going to be a very good player for us going forward." 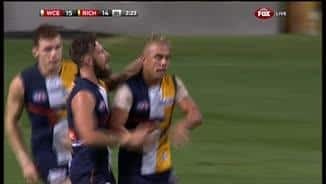 The Eagles dominated the ruck contests, winning an incredible 81 hit outs to Richmond's 27 on the back of Nic Naitanui and Dean Cox - yet Richmond won the clearances. West Coast also had one more inside 50 and more contested possessions for the match but never got close to Richmond on the scoreboard after quarter-time. 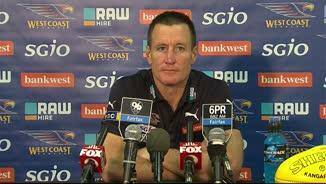 Worsfold was at a loss to explain what went wrong. "No I can’t. We had opportunities where we weren’t clean, taking the footy," Worsfold said. Josh Kennedy battled hard up forward with three goals but he was one of the Eagles' few winners on the ground. Again, their inaccuracy was costly as they hit the post six times. The only injury concern for Richmond was Shane Edwards, who was subbed out in the third term after copping a nasty poke in the eye.